An environmental disaster of yet unknown proportions is unfolding in the Gulf of Athens, known as the Saronic Gulf, following the peculiarly rapid sinking under calm seas, of an ageing, small oil tanker carrying 2,200 tons of fuel oil and 370 metric tons of marine gas oil, near the island of Salamis, on the early hours of October 11th, 2017. Decades of haphazard, boom and bust industrial development and lack of planning has turned a great part of the northern Saronic Gulf into a strange and conflicting mix of heavy industries, refineries shipyards, summer houses, restaurants, beaches, marinas, archaeological sites, and sea-farms. In the past decade, during a huge financial and social crisis, there is an effort supported by powerful private developers to relaunch the area as the Athens Riviera, a new destination with mega-projects including the construction of a coastal casino-leisure-business complex in the sprawling site of Athens Hellinikon, a former airport and military base, which until recently was also hosting Syrian refugees in derelict, athletic infrastructure built for another mega-project, the Athens 2004 Olympics. That mega-project has not been given the green light yet, as archaeologists claim that the former airport site contains important sites dating back to prehistoric times. The oil disaster may further complicate things. 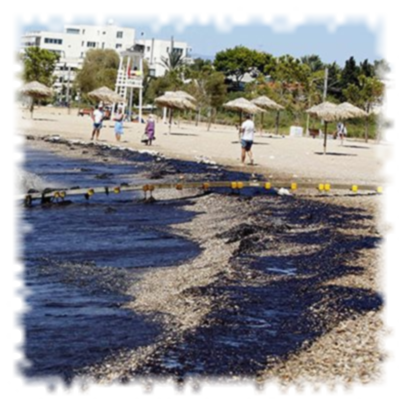 Beaches have been polluted in the sea front from Piraeus all the way south to Glyfada, with the mayor of affluent Vari-Voula-Vouliagmeni further south installing latest technology anti-pollution barriers in an effort to shield the municipality’s popular beaches. The areas’ sea-farm sector and the surviving traditional sea-fishing community are already taking a hit as is the leisure sector (beach bars and restaurants) with beaches having been declared off-limits to swimmers. The foul smell from the sea is combined with an unusually hot weather for this time of the year. The unfolding disaster should serve as a severe warning of a far larger impending catastrophe if ambitious oil extraction plans materialise in the Ionian and Aegean seas in this extremely earthquake-prone region. These events are taking place during a week where a Canadian Gold Mining company threatened or appeared to threaten, to pull out from a major gold mining project in Skouries near Halkidiki, another major tourism destination. That controversial & heavily contested project in one of the few remaining densely forested areas of Greece, has divided the local community, pitting villages populated by miners, against coastal towns living off tourism. The need for a change of economic model towards a greener direction will hopefully become clearer in the light of all the above.